In 2005 and 2006, photographer Aroon Thaewchatturat and myself traveled across Rajasthan, India´s popular north western desert state to visit some thirty heritage hotels. 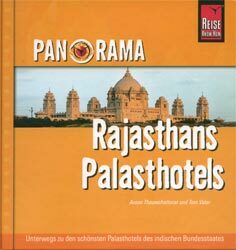 The two trips led to the publication of a photo book in Germany by Reise Know How Verlag, naturally called Rajasthans Palasthotels. To finance this venture we published stories on the hotels we visited in numerous magazines, did an entirely separate feature assignment in Goa. On each trip, we visited about fifteen properties and usually, though not always, stazed two nights in each hotel. Endless luxury, one might think. Well, sort of. Staying in a hotel while working is very different than being a guest. As a writer or photographer, one is so focused on the job at hand, that the holiday feeling never arrives. Reviewing and photographing luxury hotels (which happen to be, thankfully, also stunning heritage properties) for different magazines and a book project proved to be a challenge. While the gaudy and ostentatious Rajput style of some of the properties we visited literally took our collective breath away, for the most part, the job remained at the forefront of our thoughts. Curiously, this could not always be said for our gracious hosts. In most palace hotels, we had the opportunity to meet the owners, the former ruling family. And they proved to be an illustrious and unpredictable lot. In many palaces, we were treated like welcome guests, in a few like cleaners. In some heritage hotels we received the best rooms, in others the most modest. In every single heritage palace, the owner of the house proved to be more fascinating that the property itself. Today´s hotel proprietors are the former kings and princes of Rajasthan, men with one foot firmly in a past golden age, the other in 21st century India. That’s not always comfortable. One of the magazines that supported us at the time was Lifestyle + Travel, a Bangkok based travel mag, then edited by Peter Myers, who ran many of our features at the time, despite the fact that we sometimes had nothing very good to say about the hotels we visited. This is both the perfect resort to take a luxurious break from the challenges of luxury travel on the Indian subcontinent (only those who travel luxuriously will be able to afford a room here), and to indulge in an expensive imitation of the lifestyle of the legendary Maharajas of Rajasthan, supported by state-of-the-art contemporary amenities. A 32-acre oasis, inspired by 17th-century Mughal landscape features designed by Bangkok-based Bensley Design Studio, Rajvilas, which opened its doors in 1997, rises out of the fringes of Jaipur’s urban squalor, and offers deluxe rooms, villas with private pools, luxury tents, a royal tent and a royal villa – once occupied by former US President Bill Clinton during his visit to India in 2000. The standard rooms are unremarkable in comparison to those in other five-star properties in the region, and at more than USD 500, rather overpriced. But the luxury tents convey much more flair and position the guest firmly in India. The white marble bathrooms are designed to allow for maximum natural light and have the ambiance of large, well-kept tanks for large well-kept reptiles. The rooms are built in small clusters around a 250-year old Hindu temple, utilising traditional Rajasthani building techniques – lime plaster covers the exterior of the main hotel fort building and numerous pools around the property are inlaid with exquisite blue pottery tiles in vibrant shades of turquoise, lapis and ultramarine; all executed in a monumental effort of painstaking craftsmanship and patience, guests are assured. The main building, constructed in the style and shape of a Rajasthani fort, contains the Surya Mahal Restaurant, which serves a wide selection of expensive Indian, European and South East Asian dishes. The Indian food is excellent. In winter, guests may take their meals in an open courtyard with a marble amphitheatre set in a shallow pool, which serves as a stage for dance and music performances. The Rajwada Bar, with its faux-colonial flair faintly reminiscent of a 19th century Raj gentleman’s club, contains an extensive if obscure library of coffee table books and leather-bound tomes on 19th century colonial politics. A large log fire warms guests on chilly desert nights. Stone elephants guard the pool, and a large gym, two tennis courts and a five-hole putting green compete for guests’ active times. Daily yoga classes are complimentary. Should the journey from room or pool to restaurant appear too strenuous, there’s always an electric golf buggy around to whisk you to your next destination. Service is perfect but informal. The hotel is structured to allow for maximum privacy and minimum interaction amongst guests. And, for those who want to avoid looking at thousands of struggling urban poor on the way from the airport to their room, there’s even a helipad. Here is one of our heritage hotel stories, Pleasure Palaces, the Top 10 of Rajasthan’s best luxury palaces.